September 10, 2014 -- Using a homegrown MRI protocol, researchers found that a loss of myelin in the gray matter of multiple sclerosis (MS) patients' brains was a strong indicator of disease severity, according to a study published online September 10 in Radiology. While myelin loss in white and gray matter in MS patients has been seen in postmortem pathological studies, this research for the first time establishes its clinical significant in gray matter, thanks to macromolecular proton fraction (MPF) mapping. "We found with this study that MPF in gray matter is significantly stronger and correlated with the [patient's] clinical status. In other words, it seems a much better predictor of disability in MS patients," lead author Vasily Yarnykh, PhD, an associate professor in the University of Washington's department of radiology, told AuntMinnie.com. "From the first analysis, it was quite surprising because MS is typically considered a white-matter disease." MPF mapping provides information on the content of biological macromolecules, which are large molecules, such as proteins, lipids, and carbohydrates, found in tissues. The imaging technique has been slow to develop because it takes so long to acquire data. However, Yarnykh and colleagues developed a protocol that enables faster generation of whole-brain MPF maps to reflect the macromolecular content in tissue. They described the technique in a paper published two years ago in Magnetic Resonance in Medicine (July 2012, Vol. 68:1, pp. 166-178). Earlier this year, a follow-up study was published in which MPF was used to evaluate soldiers who had experienced one or more blast-related mild traumatic brain injuries. The goal was to determine if the after effects might relate to structural or functional brain abnormalities versus comorbid depression or post-traumatic stress disorder (PTSD). The veterans exhibited "abnormalities of brain white-matter structural integrity and macromolecular organization and cerebral glucose metabolism that are not related to comorbid PTSD," Yarnykh and colleagues concluded. "These findings are congruent with recent neuropathological evidence of chronic brain injury in this cohort of veterans" (Journal of Neurotrauma, March 1, 2014, Vol. 31:5, pp. 425-436). Now, the researchers have extended MPF mapping to multiple sclerosis, which is characterized by a loss of myelin, the fatty protective sheath around nerve fibers. Myelin is most abundant in the brain's white matter, but it is also found in smaller amounts in gray matter. "Because [multiple sclerosis] is a disease in which demyelination is a key pathologic substrate of neural tissue damage, MS represents a primary area for potential clinical applications of fast MPF mapping," the authors wrote (Radiology, September 10, 2014). The current study included 14 healthy control subjects, 18 re­lapsing-remitting MS patients, and 12 secondary-progressive MS patients. The participants underwent 3-tesla MRI (Achieva, Philips Healthcare) with a transmit-receive head coil to create 3D whole-brain MPF maps to view white matter, gray matter, and MS lesions. MPF was significantly lower in both white and gray matter in the relapsing-remit­ting MS patients, compared with the healthy controls, with decreases of 6.5% and 5.4%, respectively. MPF was also significantly lower in normal-appearing brain tis­sue and lesions in the patients with secondary-progressive MS, a more advanced form of the disease, compared with the relaps­ing-remitting MS patients. The largest decrease was in gray matter (13.4%), followed by lesions (11.7%) and white matter (6.4%). 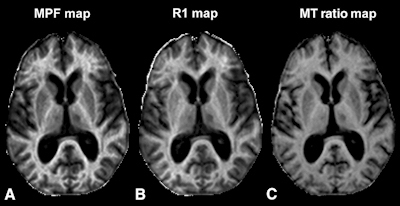 Images show axial sections of 3D MPF, relaxation rate (R1), and magnetization transfer (MT) ratio parametric maps from a 63-year-old woman with secondary-progressive MS. The 3D MPF maps were reconstructed from MT-weighted images and R1 maps. MPF outperforms MT ratio and R1 in detecting MS-related tissue changes. Images courtesy of Radiology. While white-matter MPF had a weaker connection to clinical disability than MPF in gray matter, white-matter MPF was better at discriminating between the relapsing-remitting MS patients and the healthy control subjects. "This finding suggests that demyelination in white matter may be more pronounced at earlier stages of the disease compared with gray matter, and MPF in white matter could be a more appropriate target to monitor therapeutic effects in early MS," they wrote. "The key finding of this study is the high clinical relevance of MPF in gray matter, which showed the strongest correlations with clinical scores and the largest distinc­tion related to disease course," the authors concluded. "Notably, MPF in secondary-progressive MS patients was dispropor­tionally reduced in gray matter compared with white matter." The results could benefit MS patients in terms of assessing disease response, according to Yarnykh, who also serves as associate director of imaging physics at the university's Bio-Molecular Imaging Center. "Current measures of disease activity used in clinical trials are mostly based on lesions and therapies that are used to reduce inflammation," he said. "However, they're not tools that could provide information about myelin damage or repair. In view of efforts for standard therapies ... to protect myelin and promote remyelination, this information can provide the most direct and biologically relevant biomarker for such clinical trials." MPF results might also become a kind of clinical tool, similar to blood pressure or temperature, to indicate a patient's response to therapy or disease progression. Yarnykh and colleagues plan to continue their research and currently have a pilot study underway with support from the National Multiple Sclerosis Society and the U.S. National Institutes of Health.